Cook was the pastor of the Second Baptist Church of Wilmington, Delaware when he published this book in 1884. It has been reprinted by Revival Literature. I always enjoy these older histories that have no bones to pick or dues to pay by what they say or report. 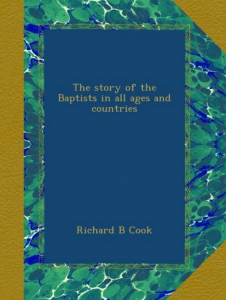 Cook’s obvious objective was to put the historic accounts of Baptist sufferings in print for posterity. Whether being persecuted by the Roman Catholic Church or the Episcopal Church of England, the Baptists on both continents have had to carry on their heritage through bloody seas. The same Protestants who were severely persecuted to the death by the Roman Church, within a generation did the same to Baptists, often putting them to death in the very same place and manner. Cook’s style is also very readable.